Not many tourists who prioritize New Zealand as a tourist destination. In addition to its far location also literally it is located at the end of the world. New Zealand also overshadowed when compared with other tourist destinations such as cities in Europe, Japan, South Korea, and the United States. 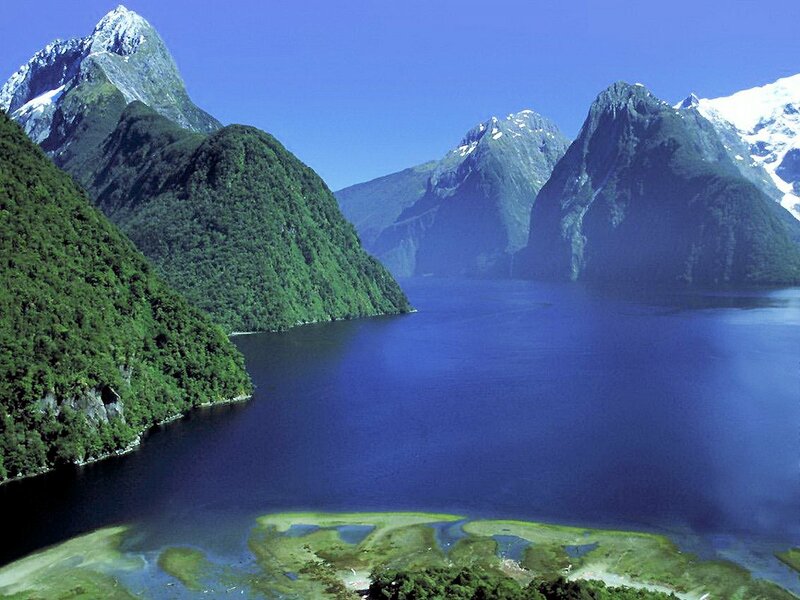 Fiordland was founded in 1952, Fiordland National Park now has an area of more than 1.2 million acres, in Fiordlands you will find a place that has many glaciers with deep fiords, and the most famous one is Milford Sound. 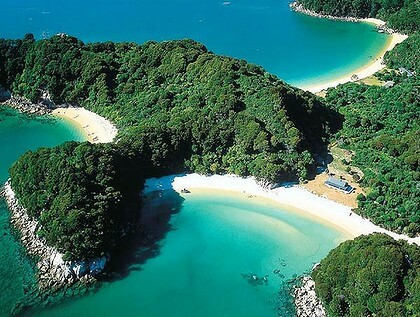 Abel Tasman National Park is a national park located at the north end of the South Island of New Zealand, the park was established in 1942, this park has an area of 225.3 square kilometers and is the smallest park of all national parks in New Zealand. This park consists of woods, hills in the northern valleys of the Takaka and Riwaka River, and in the north it is bounded by the waters of Golden Bay and Tasman Bay. 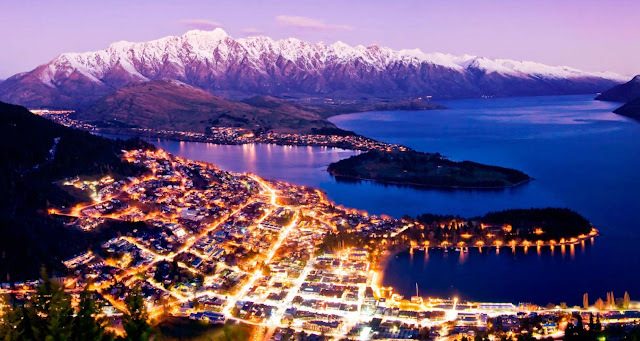 Queenstown is a tourist town in Otago in the south-west side of New Zealand South Island. The place is built around an inlet called Queenstown Bay on Lake Wakatipu, a long thin Z-shaped lake formed by glacial processes, and has spectacular views of nearby mountains. Queenstown is the main goal of the most popular destination and is considered as unforgettable adventure place of New Zealand. Queenstown is used mostly by the tourists as bungy jump sites and many other outdoor activities such as rafting and Shotover jet. Queenstown is one of the popular places to visit in New Zealand. Rotorua is a town on the southern edge of Rotorua Lake in the region Bay of Plenty on the North Island of New Zealand. Rotorua is famous for its geothermal activity. There are a number of geysers, famous Pohutu geyser at Whakarewarewa, and hot mud pools in the city which is derived from Rotorua caldera. 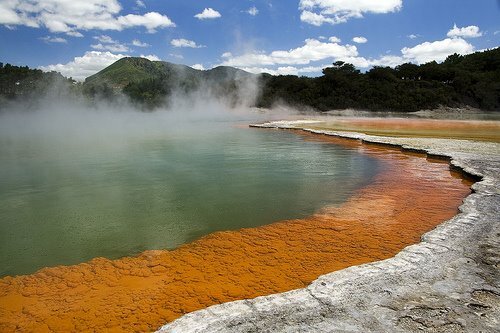 Rotorua won the "Most Beautiful City Award in New Zealand" in 2002 and 2006. 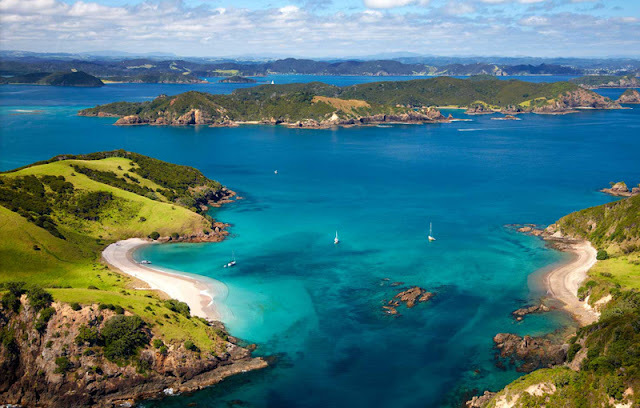 The Bay of Islands is a place you should visit if you are visiting New Zealand. This is the famous place for having 144 islands, with many superb beaches and secluded bays and an abundance of marine life. It is one of the popular places to visit in New Zealand. The place is located in the capital city of New Zealand, Wellington, where you can see and expose the beautiful scenery of the city entirely. 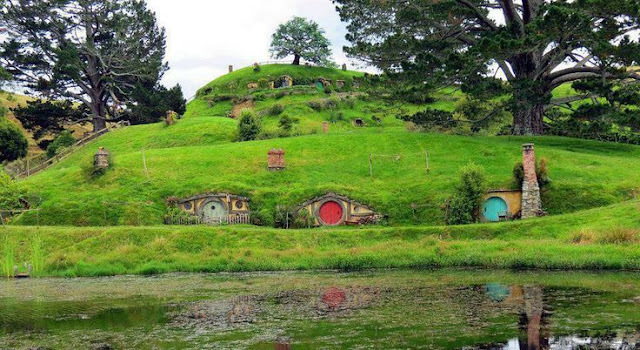 If you are a fan of the movie trilogy The Lord of the Rings, you must be familiar with this place. Here you can see one of the hills was used as the filming location of The Lord of the Rings when Frodo Baggins, the hobbit, hiding from the Black Riders or Black Riders servants of Sauron in the first film of the The Lord of the Rings trilogy: The Fellowship of the Rings. 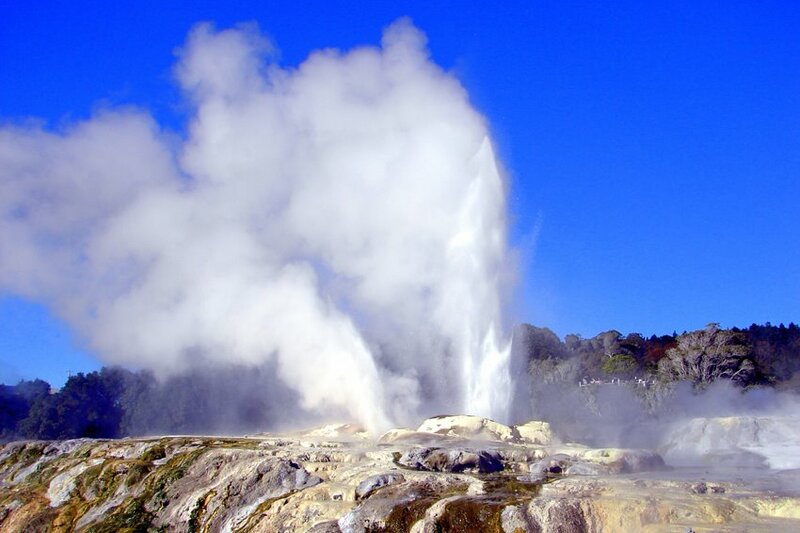 Named Pohutu Geyser, located in Rotorua is entered into the list of Top Five Geyser in the World by Lonely Planet. No wonder if the Lonely Planet incorporate this natural phenomenon into the list, because you will be amazed with powerful bursts of geothermal that are capable of spraying water up to a height of 30 meters. Although the water which is sprayed from the geyser is really hot, but the water down the river under the geyser is very cold just like the water from the fridge, so the ducks can still swim in the river comfortly. For you who like the movie The Lord of the Rings and The Hobbit, you must have been familiar with this place. Yes, it is true! This place is the location of The Shire, a small village inhabited by the hobbits in the world of Middle-earth mythology legendary written by JRR Tolkien. 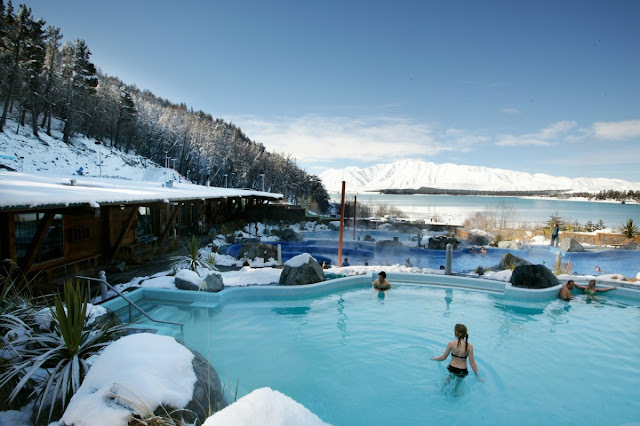 Tekapo Lake is located three hours from Christcurch, one of the cities in the South Island of New Zealand. Once entering the South Island, you will be spoiled with a beautiful view of the rows of the Southern Alps. In Tekapo lake itself, you can see the beauty of Lupin flowers. The flower which at first glance looks like a Lavender flower actually came from North America, but was introduced in the 1950s by Connie Scott and grows abundantly in New Zealand. Because of the fertile, this flower was firstly considered pests by residents of New Zealand due to its fast spreading and growing. 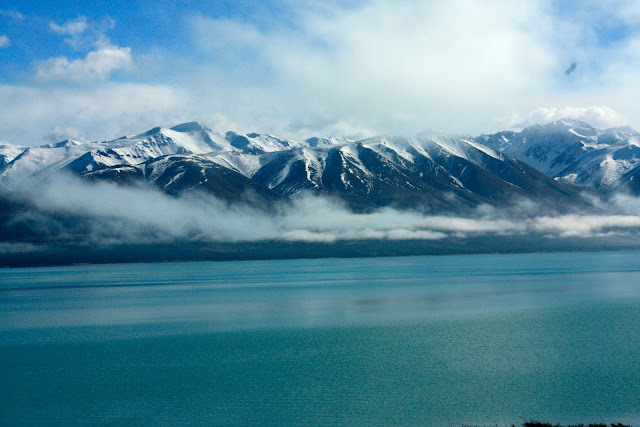 This lake is the largest lake in New Zealand with an area of 178.7 km². Here you can see the highest peak of New Zealand which is always covered by snow. Another extraordinary and unique thing of this lake is the color of the lake which is blue just like the expanse of the sky. The blue color of the Sky is caused by the dust of the glaciers that is formed at the bottom of the lake.